Life's Little Stars: Don't be coasting through life, yo! Apologies for the lack of activity on the blog-a-sphere! I have been crazy busy with university, school and life in general, so it has been hard to find time to sit down and write a blog post worth reading. It's nearly midnight now but I wanted to do a quick post to say 'hello' and share a little tidbit with you. Last week I was driving down the road (yes, a road) and I came across a Land Rover parked up on the street. 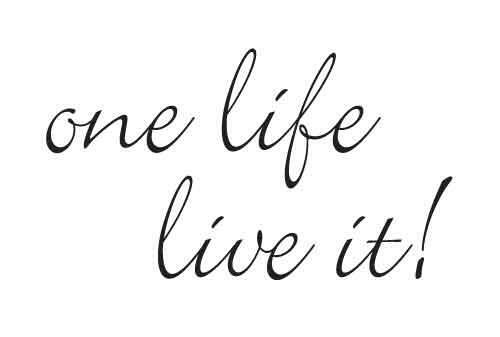 On the side, in huge letters, it said 'One Life Live It'. It sort of hit me hard because I know how stressed out I have been recently, really moody and narky because of all the pressure at university, and I could not think of one think that I had done recently that I would say fitted into 'One Life Live It'. I've sort of been coasting through life doing everything I can to pass this course. It is so easy to get lost in areas of your life that don't necessarily count as you 'living' your life. Think about the last time you got some negative feedback at university or work; how did it make you feel and how long were you in the dumps? Now take a step back and think about all the positive things in your life that you take for granted and look at ways to enhance them and really live your life. What is the point of life if you don't live it? I am giving myself a goal to try a new thing every week (everyday would just take the fun out of it and it'd become a chore) and I have already took a step to accomplishing it. I have booked myself some guitar lessons! I am so excited! I cannot wait to rock out to Oasis, Maroon 5 and Coldplay. How are you changing your life to suit you? Its always good to stop and take stock sometimes :) ...Good luck with guitar lessons! I'm having them on Thursday! very interesting blog here. i like it. and the front picture is so true!